Chapter 3 is the first of the Psalms with a title (sometimes called a sub-script or superscription). These titles are not part of the inspired word, but they are ancient. And they have had their critics who question their accuracy, although we have been given no good reason for doing so. This one reads “A Psalm of David, when he fled from Absalom his son,” which refers to the events of 2 Samuel 15-17 (here, particularly to 2 Samuel 15:13-17). How quickly and completely David’s fortunes had changed! He was king, but his own son had conspired so successfully against him that David had to flee from Jerusalem, fearing that even the city he had built and loved would be destroyed if he remained, as Absalom now commanded more of his army than he did. David was a hunted man, now in danger of losing even his life. Yet the remarkable lesson for us in verses 1-6 is that this unbelievably painful crisis brought him closer to God, rather than leaving him feeling abandoned. 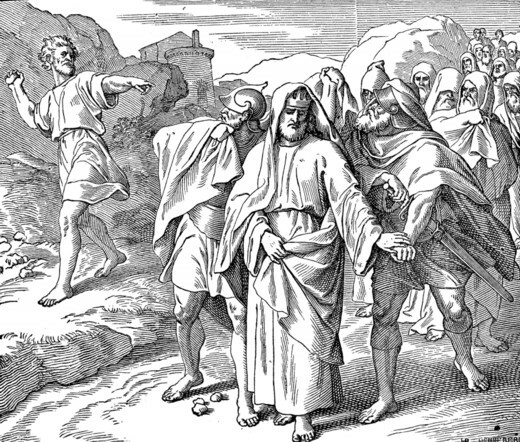 Shimei throwing stones at David. When reading in verse 2 that “many are saying of my soul, there is no salvation for him in God,” one cannot help but think of Shimei in 2 Samuel 16:7-8. But David professes his faith that his enemies cannot stand against him with the Lord on his side (verses 7-8) – the same kind of faith Paul encourages in Romans 8:31 (“If God is for us, who can be against us?”). As David gives all glory to the Lord, he unselfishly asks blessings on all His people (verse 8). Though his situation was dire and the odds against him, David took comfort in knowing the Lord heard his cry, and He will hear ours. He always does!